Taking a trip to the Lake District is a brilliant way to experience all that this stunning part of the United Kingdom has to offer, and renting a self-catering cottage hidden in the thickets of the trees or perched by the mountainside overlooking the lakes is the perfect way to soak up this incredible atmosphere. If you are a keen walker or hiker, then there are countless nature trails, mountain rambles and picturesque strolls by the lakes that you can take, and there is no better place in the country where you can walk by such a beautiful backdrop. The Lake District can be found in the north western part of England in the county of Cumbria. This mountainous region is a protected National Park, and the sweeping hills, dense forestry, quaint villages and towns full of character and of course, sleek and stunning lakes which stretch for miles make the Lake District a unique and incredible place to visit. If you are thinking about renting a self-catering cottage in Lakeland so that you, your loved one, friends and family can participate in several walks while on holiday, then there is no place more perfect than the Lake District to do so, and going on a walking holiday in this stunning region will be a trip that you will never forget. So if you have decided that you do wish to take pleasant strolls or more challenging hikes through the Lake District, you will be pleased to know that there are countless different routes that you can take. One of them is walking by the tallest mountain in England, Scafell Pike near to the town of Keswick. 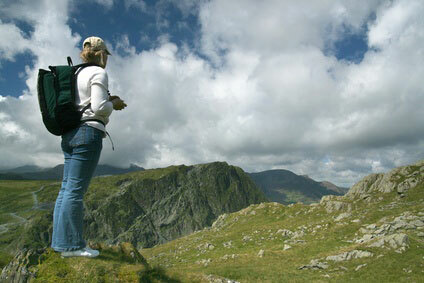 This walk takes a classic trail from Seathwaite through Styhead Tarn and the Corridor Route and ends in the Scafells. The walk is quite challenging but incredibly rewarding, and is a must-do if you are on a walking trip in this region. Another walk that is very popular to take is the twelve mile walk through the Lakeland Fells including Seat Sandal, Fairfeild and Low Pike. The climb is tough but the spectacular views are worth it, and you will feel very pleased with yourself after completing this hike! If you plan on taking more relaxing strolls and rambles then the Windermere and Bowness areas offer plenty of these types of walk. A lovely one to do is to take the relaxing walk by the Elterwater Waterfalls. Of course, just taking a wander by Lake Windermere makes a lovely amble, and the views are so stunning that you will probably feel a million miles from home! There are so many options for self-catering holidays in the Lake District that it can be hard to choose just where to stay and which walks to go on. All rented cottages, however, come fully equipped with everything you will need to make your trip the most perfect one possible. With hot tubs, private gardens, four poster beds and cosy log fires, your Lake District cottage holiday is sure to be one to remember fondly for a very long time.